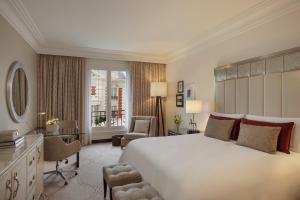 Spacious luxury suites with marble bathrooms, charming gardens and swanky gourmet restaurants and bars can be enjoyed at The Four Seasons hotel in Buenos Aires. 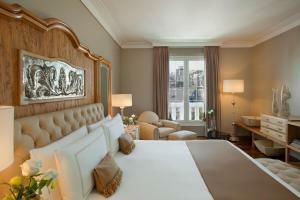 It is the only hotel in the exclusive Recoleta neighbourhood featuring an outdoor swimming pool in the gardens. Guests can also relax at the award-winning spa and state-of-the art gym. Wi-Fi is free. The Four Seasons Hotel is divided over a contemporary tower and a stunning 20th-century French-style mansion styled with local artwork and upscale decor. 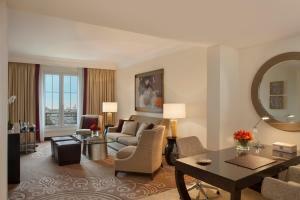 The suites include air conditioning, a minibar and a TV. All bathrooms feature an HD TV mirror. Cielo Spa offers a tango and polo inspired menu of therapeutic massage and salon treatments and a soothing atmosphere styled with contemporary décor. Guests can dine gourmet Argentine cuisine at the Elena design restaurant, or treat themselves to a custom-made cocktail prepared by expert mixologists at Pony Line Bar, the first Polo bar in Argentina. Nuestro Secreto offers a relaxed and trendy indoor-outdoor atmosphere by the pool where guests can experience an Argentine-style BBQ. Four Seasons Hotel is located just a 3 minutes´ drive from the centre of Buenos Aires and near touristic points such as the Obelisk and the Colon theatre. Ezeiza International Airport is a 45-minute drive away and a shuttle service can be provided. Featuring views of the city, this king room is furnished with wooden and leather fittings, dressed up in bourdeaux and beige strokes, which bring a touch of brightness to the room. 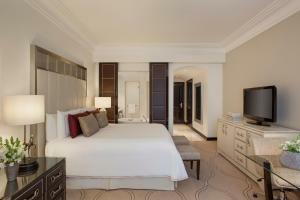 The bedroom includes a king-size bed, a 42" LED TV and a work desk. The full bathroom is fitted with Italian marble, styled in cream and blue hues, a bathtub, a shower, a TV and sliding doors. 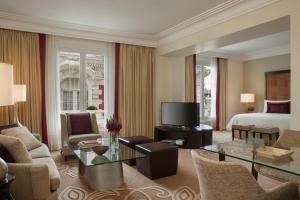 Rate: US$ 401.25 ... US$ 10080.00; select dates below to get current rates. Featuring views of Álzaga Unzué palace, "La Mansión", this king room is furnished with wooden and leather fittings, dressed up in bourdeaux and beige strokes, which bring a touch of brightness to the room. The bedroom includes a king-size bed, a 42" LED TV and a work desk. The full bathroom is fitted with Italian marble, styled in cream and blue hues, a bathtub, a shower, a TV and sliding doors. Featuring views of Álzaga Unzué palace, "La Mansión", this suite is furnished with wooden and leather fittings, dressed up in bourdeaux and beige strokes, which bring a touch of brightness to the room. Shaped like an "L", the room integrates a living room and a bedroom, both featuring 42" LED TVs. It is also fitted with a spacious wardrobe, a sofa and a comfortable work desk. Two large windows allow natural light into the room. The full bathroom is fitted with Italian marble, styled in cream and blue hues, a bathtub, a shower and a TV. This elegant room comprises exclusive access to the e-Lounge, an intimate seating area featuring 3 chandeliers, a 52" LED TV and WiFi access. It offers complimentary non-alcoholic beverages and coffee from 8:00 am to 9:00 pm, and includes a spacious furnished balcony overlooking Río de la Plata river. Guests staying here can enjoy some laundry facilities and discounted spa treatments. Featuring views of Álzaga Unzué palace, "La Mansión", this suite is furnished with wooden and leather fittings, dressed up in bourdeaux and beige strokes, which bring a touch of brightness to the room. Shaped like an "L", the room integrates a living room and a bedroom, both featuring 42" LED TVs. It is also fitted with a spacious wardrobe, a sofa and a comfortable work desk. 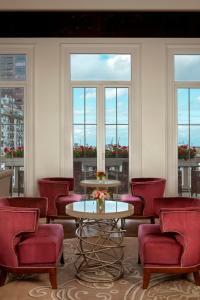 Two large windows allow natural light into the room. The full bathroom is fitted with Italian marble, styled in cream and blue hues, a bathtub, a shower and a TV. Featuring views of 9 de Julio Avenue, this suite is furnished with wooden and leather fittings, dressed up in bourdeaux and beige strokes, which bring a touch of brightness to the room. The gracious living room is fitted with high ceilings, a sofa bed, 2 comfortable armchairs, a coffee table and a work desk. French doors separate this area and the over-sized bedroom, which features its own walk-in closet, a king-size bed and a 42" LED TV. The full bathroom is fitted with Italian marble, styled in cream and blue hues, a bathtub, a shower and sliding doors. Featuring views of 9 de Julio Avenue, this suite is furnished with wooden and leather fittings, dressed up in bourdeaux and beige strokes, which bring a touch of brightness to the room. Elegant Roman columns lead the entrance to a gracious living room with a sofa bed, 2 comfortable armchairs, a coffee table and a work desk. French doors separate this area and the spacious bedroom, which features its own walk-in closet, a king-size bed and a 42" LED TV. The full bathroom is fitted with Italian marble, styled in cream and blue hues, a bathtub, a shower and sliding doors. This elegant room comprises exclusive access to the e-Lounge, an intimate seating area featuring 3 chandeliers, a 52" LED TV and WiFi access. 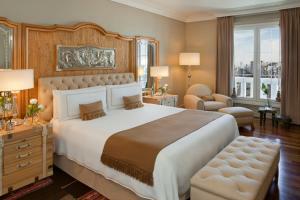 It offers complimentary non-alcoholic beverages and coffee from 8:00 am to 9:00 pm, and includes a spacious furnished balcony overlooking Río de la Plata river. Guests staying here can enjoy some laundry facilities and discounted spa treatments. Featuring views of Álzaga Unzué palace, "La Mansión", this twin room is furnished with wooden and leather fittings, dressed up in bourdeaux and beige strokes, which bring a touch of brightness to the room. 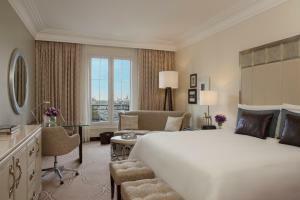 The bedroom includes a king-size bed, a 42" LED TV and a work desk. The full bathroom is fitted with Italian marble, styled in cream and blue hues, a bathtub, a shower, a TV and sliding doors. Featuring views of the city, this twin room is furnished with wooden and leather fittings, dressed up in bourdeaux and beige strokes, which bring a touch of brightness to the room. The bedroom includes a king-size bed, a 42" LED TV and a work desk. The full bathroom is fitted with Italian marble, styled in cream and blue hues, a bathtub, a shower, a TV and sliding doors. The E-Lounge Room king bed is equipped with a flat-screen TV, a DVD player and a minibar. The private bathroom includes free toiletries, a hairdryer and a bathrobe. 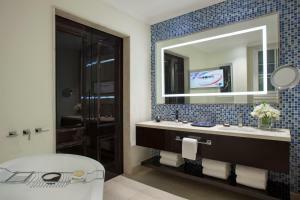 Guests staying here can enjoy some laundry facilities and discounted spa treatments. 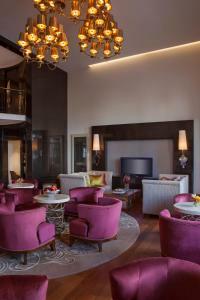 This elegant room comprises exclusive access to the e-Lounge, an intimate seating area featuring 3 chandeliers, a 52" LED TV and WiFi access. It offers complimentary non-alcoholic beverages and coffee from 8:00 am to 9:00 pm, and includes a spacious furnished balcony overlooking Río de la Plata river. Featuring a French style, this premier suite is equipped with a comfortable living room, including a sofa, a work desk, WiFi access, a LCD TV, DVD and CD players. 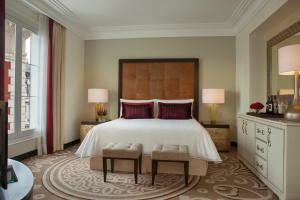 The main bedroom is comprised of a king-size bed and modern amenities. It also includes a private bathroom, furnished in marble fittings, featuring a shower and a bathtub. Interconnected rooms are available, as well as a pillow menu. Featuring a French style, this premier suite is equipped with a comfortable living room, including a work desk, WiFi access, a LCD TV, DVD and CD players. 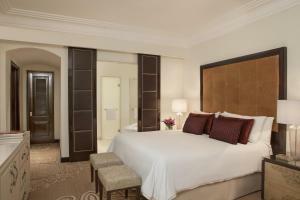 The main bedroom is comprised of a king-size bed, with the option of 2 twin beds, a dressing room, and modern amenities. It also includes a private bathroom, furnished in marble fittings, featuring a shower and a bathtub. A pillow menu is available. 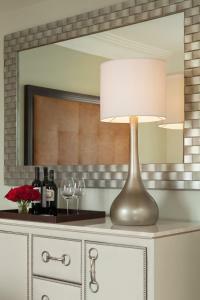 This suite features a classic French style. 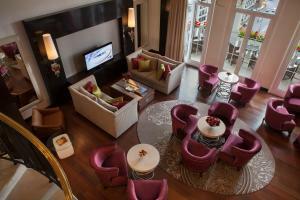 It is fitted with a king-size bed, a flat-screen satellite TV, a DVD player, a minibar and a comfortable dressing room. There is a seating area, completed with a tea table, a work desk, a telephone, a computer and WiFi access. The full bathroom is equipped with a spa bath, free toiletries, a hairdryer and a bathrobe. Guests staying here can request a pillow menu. 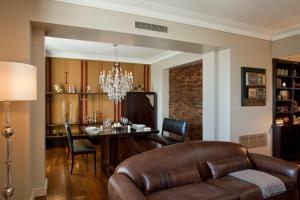 Located on the highest floor, this suite features impressive views of 9 de Julio Avenue and the Obelisk. 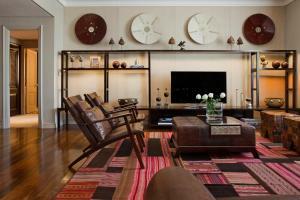 With a contemporary style, the room is equipped with wooden floors and stylish furniture. 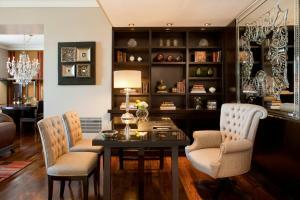 It includes a large dining table and a spacious seating area, completed with a leather sofa, a work desk and two chairs. 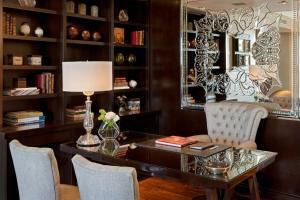 Decorative mirrors featuring hand-carved details dress up the walls. 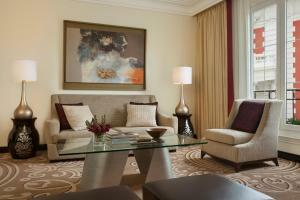 This air-conditioned suite is also fitted with a flat-screen satellite TV, DVD player, minibar and safe. 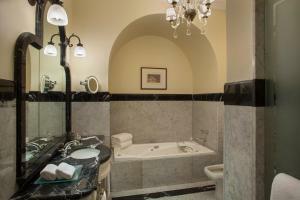 The private bathroom has marble fittings and includes a bathtub, free toiletries, a bathrobe and a hairdryer. This king suite features a stylish décor and a living room fitted with a comfortable sofa, a coffee table, and a classic fitment with a LCD TV on top. It has a fax, a printer, WiFi access and a telephone. It also includes a balcony overlooking the garden. The bathroom displays Italian marble fittings and a deep soaking bathtub. Guests staying here can enjoy: housekeeping services; a daily American breakfast for 2 persons; a private entrance; free WiFi access; free airport shuttle services; a pillow menu; ironing service for 2 clothes; a selection of international newspapers; and a relaxing immersion bath set prior to their arrival. 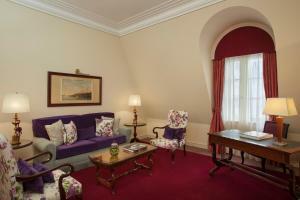 The Presidential King Suite features an oak foyer, a comfortable living room and a spacious dressing room adorned with mirrors. It is fitted with a LCD TV, a work desk, WiFi access, a telephone and a fax. It includes a balcony overlooking the garden. Well-equipped kitchen facilities comprise an oven, a microwave, kitchenware, a coffee machine, among others. A wide selection of wines is available as well. The main bedroom is fitted with a king-size bed, a work desk and a hand-carved wooden wardrobe. The bathroom displays 3 different types of marble fittings and a deep soaking bathtub. Guests staying here can enjoy: housekeeping services; a daily American breakfast for 2 persons; free WiFi access; free airport shuttle services; a pillow menu; ironing service for 2 clothes; a selection of international newspapers; and a relaxing immersion bath set prior to their arrival.